Fisher, Seymour and Roger Greenberg. With the latest generation of psychoactive drugs, has pharmacology at last triumphed over mental illness? A close look at world scientific literature would suggest otherwise. The sobering truth is that many claims about the efficacy of drug therapies for everything from depression to schizophrenia have been exaggerated. What, then, accounts for the inflated confidence clinicians and the lay public alike often have in the new generation of “wonder drugs”? Find out in From Placebo to Panacea. 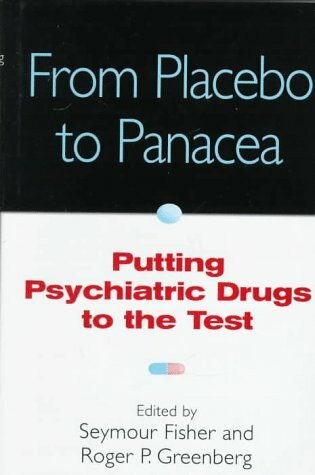 From Placebo to Panacea is not an indictment of drug therapy. Rather, it is a reasoned analysis of the efficacy of psychoactive drugs as compared to other forms of treatment–backed by hard empirical data. Above all, it is meant to function as a therapist’s and patient’s guide to making more informed decisions when considering treatment options.